The Democratic Republic of Congolese armed forces say they have taken control of the rebel headquarters in the eastern town of Mushake. After a night-long barrage, the army overran Gen Laurent Nkunda's base, their field commander told the BBC. He said fighting was continuing in the town, and that his men were also under fire from rebels, who had withdrawn into the nearby mountains. UN peacekeepers supporting the government confirmed the army progress. The UN mission in DR Congo (Monuc) has been providing logistical support to the Congolese armed force (FARDC) and on Tuesday said that as a last resort it would also "provide fire support" against the rebels. The BBC's Arnaud Zajtman, who is just a few kilometres from the front line, spoke to the FARDC field commander, Col Tshibangou, who said his men had taken Gen Nkunda's headquarters at 0600 local time (0400 GMT) but did not yet fully control the town. The long-threatened offensive against Gen Nkunda began on Monday with the army retaking several rebel-held villages in the east. Our correspondent says some villagers have already started to return to their homes. He also says children from the nearby villages were helping to carry rockets for the Congolese army. Monuc spokesman Kamal Saiki told the BBC's Focus on Africa on Tuesday that the UN was now ready to "provide fire support, including artillery and close air support" as a last resort. He said this would mean UN soldiers firing against the rebels - "guns in the field crewed by UN soldiers". The 15,000 UN soldiers in DR Congo are tasked with securing peace after a five-year conflict officially ended in 2002. But Mr Saiki said the Monuc mandate included supporting the legal authorities "with all necessary measures against any attempt by illegal armed groups to jeopardise the political process". 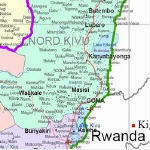 Mushake overlooks a key road that links the regional capital, Goma, with valuable tin mines and rich farming land further west. Gen Nkunda claims he is defending his Tutsi community against Rwandan Hutu rebels responsible for the Rwandan genocide in 1994, who have been active in the east of DR Congo ever since. The government had repeatedly warned Gen Nkunda to stop his rebellion and integrate his men into the army. There has been no word on casualties but our correspondent says he understands that 30 wounded government soldiers were taken to hospital on Tuesday. At least 200,000 people have been displaced by the latest fighting in the area.